Ride-on toys are a great way for kids to have fun and get some fresh air and exercise, either by themselves or with other kids. 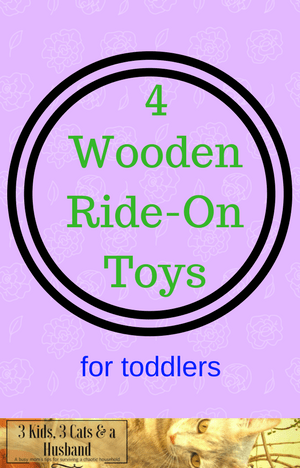 Although my kids enjoyed riding their plastic toys when they were toddlers, I’m always on the lookout for durable, high-quality toys, and found four nice wooden ride-on toys. One thing that is particularly nice about some of these is that they work well indoors as well as outdoors. These wooden “Wheely Bug” animal toys are available not only as this cute hedgehog, but also as a cow, mouse, tiger, pig or bee. Whichever animal you choose, the Wheely Bug can go in any direction without any steering skills, which makes it easy to toddlers to have fun with. The antennae bounce when you “bop” them, which is particularly great for more tactile kids or little ones who are just starting to be fascinated by cause and effect. It rolls great on both hardwood floors and carpets. One nice plus that you can’t tell from the picture is that you can remove the plush cover and spot clean it if you need to. All the Wheely Bugs come in two different sizes, small and large. There is a lot of discussion in the amazon reviews of how to choose which is the right size for your child. For example, one reviewer says to measure the leg inseam and to go with the large size if it measure over thirteen inches. Reviewer Eric Keating wrote this in his review to help take some of the guesswork out of selecting the right size. Our daughter just turned one. She is 32″ tall and has a 10″ inseam. After reading the various reviews available we erred on the side of caution and bought the Small version of this Wheely Mouse. When we opened it it looked terribly small, and after trying to seat her on it and get her to move it around, it was apparent that we should have purchased the Large. Her feet were flat on the floor with knees bent and legs outstretched. The seat depth was insufficient – as soon as she slipped back even a little on the back while digging her feet in to move sideways or backwards she slid right off the back. She hulked over the top of it to the point that when she leaned forward to get it moving she practically fell over the top of the handle. So back in the box it went and we ordered the Large. I kept the Small to use as a comparison in the hopes that my pictures and review would help another parent figure out which one to buy. You can see Eric’s review with detailed photos and explanation of the size differences by clicking here. This trike is made of real solid wood (not pressed wood) and includes all the parts you need for assembly except for the tools. We bought this trike for our grandson for his first birthday, and though he is still not quite able to get on and off by himself, he was able to propel himself forward a little right away when seated on it. We read the reviews for several different “first ” trikes and settled on this one because of its durability and the fact that the back wheels have a narrow base so they don’t run over the child’s feet, which was a problem with some. My husband was able to assemble the trike very easily in about 15 minutes. The handle bars/front wheels turns just enough to turn the bike without danger of tipping the bike over. I think our grandson will get a lot of use out of this handsome trike! Unfortunately, it has some minor details to make it less than you might expect from a retro toy. For one thing, the seat itself isn’t wooden, but instead is a hallow plastic. The tires are plastic with only a rubber coating, as opposed to being solid rubber, and the bell isn’t a traditional bell, but has a plastic piece that hits the metal to make it ring. It’s an adorable bike and my son loves it, but i purchased it for christmas and as i was up late christmas eve i had to re-drill pilot holes that weren’t the proper size and depth for the screws included for assembly, not to mention the fact that they weren’t properly lined up either. the hole thing should have taken about 10 minutes and ended up taking around 2 hours. i had to hammer this thing together like a caveman, and was left with a lopsided crooked scooter bike. i wish it had been manufactured with a little more care. sadly the factory machine assembly line world we live in doesn’t offer much quality. Despite these complaints, the overall reviews for this trike were fairly high at the time of this writing. This wooden toy is both a walker and ride-on in one. If that weren’t enough, it also has a xylophone on the side (and two drumsticks), plus a shape sorter on the top with three different shapes in three different colors. I think it’s a very clever use of space, and since I’m a musician myself, I love how they built a natural musical instrument (as opposed to an electronic one) into this toy. Overall, reviewers said that this toy was sturdy and well-made, and that their child loved playing with it. The biggest complaint was that it was too light in the front, causing it to possibly tip over if a toddler tried to push himself up from the back where the xylophone. One clever reviewer said that they put a five-pound dumbbell inside the front so it wouldn’t be a problem. Still others said that they never had that problem at all. Still, it’s something to be aware of and consider. This wooden toddler scooter is designed for kids who aren’t quite ready for a tricycle yet. Even very young children who can’t or don’t want to ride on it yet can still have fun pushing it around from behind and even get some help learning how to walk. The scooter is very sturdy and has a narrow shape to make it easy to maneuver. Not only that, but it’s stylish and looks great inside the house! Another plus that makes this a great indoor riding toy is that the wheels are coated with rubber, so it can be ridden around inside without fear of dinging the walls and furniture. One negative about this bike is that the seat is not adjustable. A few reviewers said they had problems with their children’s feet getting hit by the back wheels and there was no way they could accommodate for that problem. 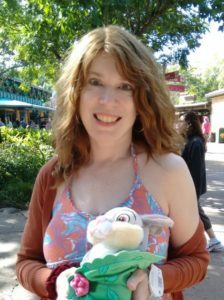 Hopefully this post has helped you find the perfect toy for your child to have a great time zooming around in!